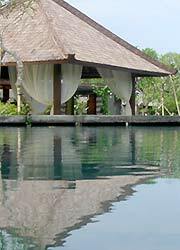 Bali Spa A spa in villa air is surrounded by the quiet nature. In this extended space, Spa Air, time never flies. They have remarkable menus such as authentic Ayuverda/Shirodara and Golden Facial with gold leaf. Each treatment room has Jacuzzi, shower and private garden. They start compounding products for treatments to guests’ arrival time. Ayurveda (the science of life) is an Indian natural healing system. In Ayurveda, we make use of preventative methods toward ill health, leading to longevity and natural balance. This treatment begins with warm herbal massage oil that helps to improve circulation, relaxing muscles and nerve fibers of the whole body. The oil is then massaged in rhythmic light stroke movements to warm the lymphatic drainage system for detoxification. Then warm herbal oil is rhythmically dripped on the forehead for mental relaxation and clarity. This massage restores balance allowing vital energy to flow, and deeply relaxes the nervous system. * Due to using warmed oil, the senior trained therapists will be in charge of the course. 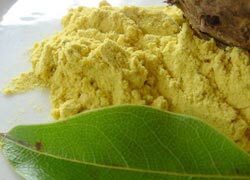 Powders made from roots and various herbs: Galanga, Ginger, Sandalwood, Star Anis, Clove, Cinnamon, Black Pepper, Nutmeg, Sesame Oil, Coconut Oil and fresh chopped Lemon are used for this treatment. Some or all of these medicines are taken, powdered and fried mix with Rock Salts, crated Coconut and Lemon juice. Then it is tied to a bolus bag and is used to massage on the body. Continue the therapy with “Herbal Bubble Bath” and “PODIKIZHI Therapy” which is effective in curing arthritis, paralysis, body pain, numbness and degenerative and neuro-muscular diseases. 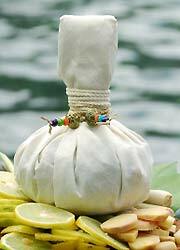 This Bolus Bag Massage uses various medicinal leaves such as Basil Leaves, Pandanus, Brahmi Leaves, Binahong Leaves, Citrus Leaves, Beluntas Leaves, Rock salt and blended dry Coconut. “Herbal Bubble Bath” and “ELAKIZHI Therapy” are great therapies to strengthen the muscles, relieve body pain, numbness, shivering, improve skin complexion, rejuvenate the body and cure diseases like arthritis, paralysis, convulsion and rheumatoid arthritis. Offering green tea pack instead, due to hard to get soy beans pack. ABHYANGA is a known treatment especially for preserving health. Normally Abhyanga is performed in 7 body postures. The benefits are enhancesing the age, relieving tiredness, weakness and inducing sound sleep. 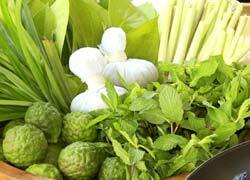 It also tones up the body tissues and strengthens the body. Get a glossy soft skin and improves the general health circulation. A special treatment with warm medicated oil stimulates and nourishes nerves relieving pain and numbness. This treatment is very effective in treating lower back pain, sciatica, slipped disc and neurological diseases of lower limb. 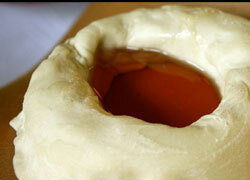 They use medicated oil over the cervical region and place a dough ring on the painful spot. The oil is then warmed and poured inside. This treatment helps loosen stiff joints, cures cervical spondylosis, neck pain, paralysis and numbness of the hand. This is a special treatment in which warm medicated oil is retained over the knee joint. This treatment is very effective in treating different conditions of the knee joints such as arthritis, degenerative conditions, and cracking of the knee joints. Disminorae Vasti is for women having a menstrual period problem. It releases pain on the stomach area. Yoga Course Recommended Also For Beginners. 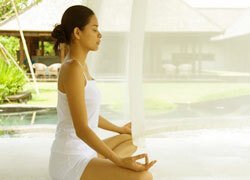 Work your body out with “Yoga” in Villa Air Bali, during your stay with us. Focusing on correct alignment, posture and breathing creates health and well being. Let’s adjust your condition in the morning, or after any spa treatments to leave your body, mind and spirit back with harmony. ※Please booking with other menu. This massage is an ancient healing therapy done with giving pressure by thumbs, palms and elbows to relieve stress, tension and joint pain. You will feel a deep relaxing sensation throughout the internal organs. It is a unique blend of Ayurveda, Acupressure and Balinese Massage which is signature massage of international and traditional techniques, aiming at reviving fatigued muscles and improving blood circulation and promoting an overall sense of well being. What luxury and indulgence! Your treatment starts with the ritual Traditional Massage, continues with your choice of body scrub　and choice of your body scrub treatment ends with a relaxing lime body lotion. This body polish contains papaya extract which softens and revitalizes the skin due to the mild properties of it to treat a burnt skin. After removing the extract, your body is treated with fresh yogurt leaving your skin smooth and soft to touch. This jelly and Aloe Vera extract will you a pleasant experience to heal your sunburn skin. Begin with soft massage, continuing with Aloe Vera Jelly to rub your body. It refreshes moistures and revives the sunburned skins. The treatment which used to be a part of the ceremony in the palace of Java in the 17th century has become popular among us. After the shampoo, they moisturize your hair and scalp to treat damages of them. It removes wastes and sebaceous matters. The hand spa includes brief manicure, vitamins on all nails with the use of machine and completed with hand massage. Using traditional beauty products to cleanse, refine, restore and hydrate your facial skin. Including Acupressure and Stroking massage to the face, scalp, neck, shoulders, hand and feet, you will feel refreshed and relaxed. It removes horny plugs and horny substances by stem and gentle scrub. They also use a mask for beauty to moisturize dry skins. Enjoy a flower bath with pure essential oils, tropical flowers including Cempaka, Kenanga, Frangipani, Rose Petal, bath salts and aromatic candles. Let your body relaxed and refreshes in a bath session personalized just for you! Enjoy a warm Herbal Bath; this traditional recipe helps balancing a body and works as a warm detoxifying treatment. A luxurious and nourishing special bath filled with milk and essential oils makes your skin radiantly soft. Jamu Boreh Therapy begins with “Foot Bath Ritual”, a symbolic spa to welcome ritual. 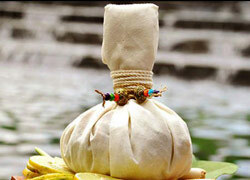 The spa at Villa Air Bali has created a therapeutic herbal spice rock salt for foot relaxation. “Acupressure Techniques” is used to renew, strengthen, and heal a body. 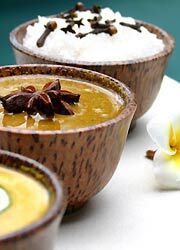 “Boreh Wrap” using pure Balinese spices and plants, helps stimulating and reviving fatigued muscles. Blended carrots they use have a moisturizing effect for skins, and Herbal Bath based on a traditional recipe helps balancing a body and works as detoxifying. Spa Air Chocolate treatment starts with a Massage to release tense muscles and moves onto Chocolate Scrub. It also helps creating a rich moisturizing exfoliation for your skin. After removing the chocolate paste, your body is treated with fresh yogurt and chocolate aromatics to moisturize the skin. The course ends with pampering with a Chocolate and Champagne Bath. Your Choice of Massage, Scrub & Bath Enjoy the relaxation until the last minutes of the treatment with drink. Massage: Acupressure, Oriental or Balinese Touch. Body Scrub: Coconut & Coffee, Lulur or Milk Scrub. Excellent Effects on Blood Circulation! The aromatic natural black mud treatment relaxes body tensions and has a great effect on anti-aging. It cures blood circulation, joint and rheumatic pain. This therapy initially begins with the “Oriental Massage” to release fatigued muscles, and then “Mineral Salt Scrub” to refresh your body condition. It also helps the body to absorb the minerals. Experience the “Spa Air” luxury royal bride package! This special therapy will rejuvenate your body and soul. It starts with “Oriental Tranquility Massage” which revives fatigued muscles and improves blood circulation and a sense of wellbeing. It will cure dry skins and prevent wrinkles. At the end, enjoy their traditional hair spa, manicure and pedicure with nail arts. Experience the “Spa Air” luxury royal groom package! This special therapy will rejuvenate your body and refresh your soul. Ritual Foot Bath followed by our “Oriental Tranquility Massage” will revive fatigued muscles and improve blood circulation promoting an overall sense of well being. Lulur Body Scrub improves your dry skin and prevents wrinkles to create a shiny skin. Enjoy manicure and pedicure in the end. Romantic Course for a Couple! This Adam & Eve honeymoon package starts with our “Siraman Ritual” to soothe and refresh your senses. Experience our “Oriental Tranquility Massage” which revives fatigued muscles and improves blood circulation and promotes an overall sense of wellbeing. Rose Scrub is applied thoroughly to exfoliate and hydrate dry skins. Rose Steam and Milk Flower Bath are truly an indulging experience, boosting the skin’s collagen and leaving your skin toned and hydrated. A soothing Rose Body Lotion perfects your intimate moments. (Reservation in advance and consultation required) Green Health Therapy aims to cleanse and purify your body and mind while relaxing in peaceful natural surroundings. It helps eliminating dead skin cells, exfoliating, and rejuvenating. Green Leaf Bath consisting of: Fresh Pandan, Peppermint Leaves, Lemongrass, Fresh Citrus, Basil Leaves and Binahong Leaves. Return transfer for Kuta, Sanur, Jimbaran, Nusa Dua and Tanjung Nenoa area is avairable with an additional charge of ＄40(＄20 one way) with booking 2~6 persons. Recommended to use Our Driver Service. Please check our carcharter service page. Fatigue after flight was not relieved, I was looking for a place to have lymphatic massage, and finally I booked here. It was the first time for me to have abhyanga massage. I felt relaxed after having massage with warm. My eyes getting fresh with head massage. After treatment my body was comfortably warm. Back to the hotel, and when I looked in the mirror I was surprised to see my skin face glowing and the skin color getting better. I wondered” did toxins come out of my skin?” Swollen feet can be reduced and I slept well at that night.